Ever wonder how to find the age of any website? In order to find the age of a site, you should look when the domain name was registered online. Internet Corporation for Assigned Names and Numbers (ICANN) is a non-profit corporation that maintains allocation of top-level and country specific domain names. There are more than two thousands companies registered with ICANN as an accredited registrar for selling domain names. The website owner needs to register the domain name with one of these accredited registrars and renew continuously to old the ownership. Checking the age of a domain is easy which can be done by looking into the domain’s record from the registrar. But you can also easily find the domain age with readymade domain age checker tools available online. First method to check any of the domain age is using WHOIS lookup database. Go to the ICANN’s WHOIS lookup tool page, type the domain name in the search box and click on the “Lookup” button. You will get all the details of the domain including creation date. 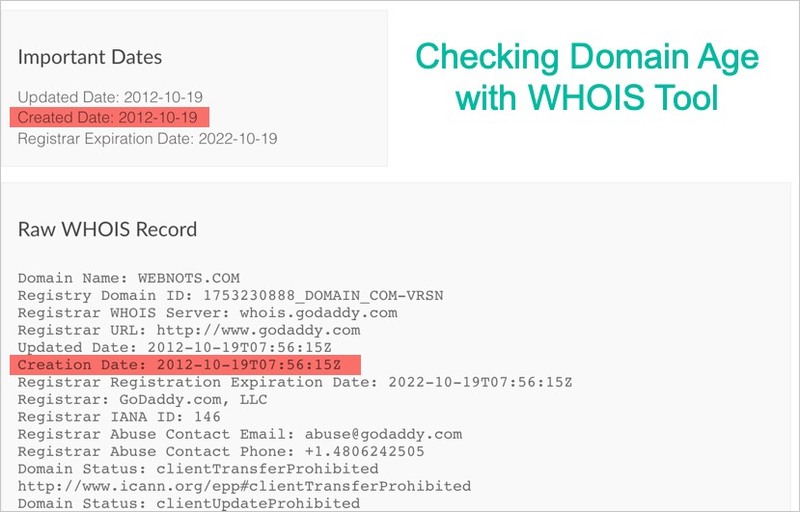 Check under the “Important Dates” section or “Raw WHOIS” section to find the date of creation of the domain. Second option is to use internet archive. 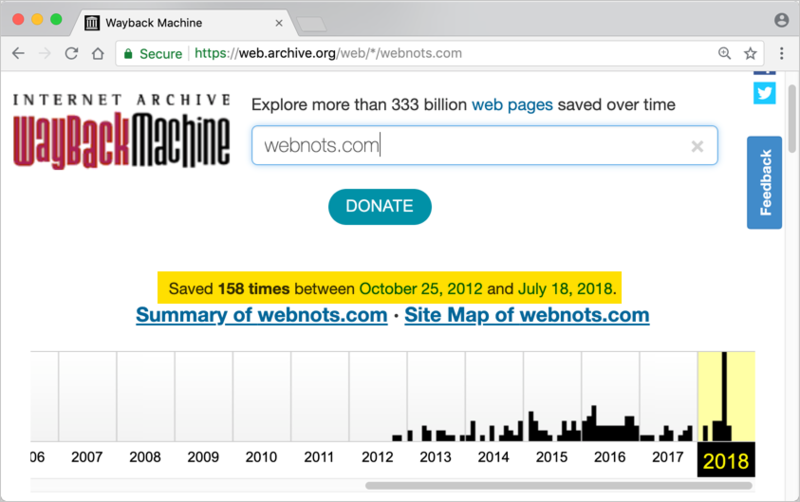 The wayback machine takes a snapshot of all the websites, that allows web crawlers not blocked by robots.txt file. Go to internet archive site and search the domain name. You will see results like below showing the number of times saved between the date range. 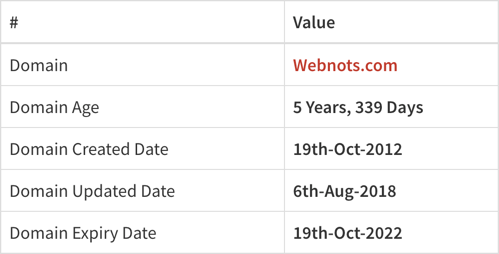 Basically you can consider the start date is nearer to the domain creation date. Go to Google and search for ‘domain age checker’. You will find hundreds of tools in the search results. Choose any of the reliable tool, enter domain name and click submit button. You will simply get the age of the entered domain like below. 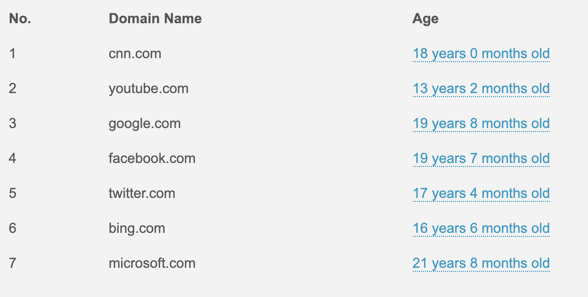 Why You Should Find Domain Age? Well, did you love any sites when browsing online? Wanted to find how many years of effort spent behind that site? The simple answer to these questions is to find the age of the domain. This is an indication that the site was online for that many years. This is a big debate on the SEO world, people arguing that domain age is not important by showing the video clip from Matt Cutts, a former Google engineer. But we feel the context of that video is different. Probably none of us know Facebook, when facebook.com was 2 months old domain. Now that, it is 20 years old domain. There are definite differences when an author publishes article in popular sites and new sites. For a new site owner, it is been a pain to drive traffic even with good quality content. It will take years to get the traffic for the quality content also. This is a known fact to every webmasters out there. In other words, domain age has considerable impact on your traffic. You can also visibly check in Google that old pages have more value and reachability than new pages on the same niche. In our opinion, just like how the experience of a person is gauged with age, webpages also will get automatic domain and page authority over the period of time. Experts also suggest the expiry date of a domain is an indication to search engines that how long the site is planned to be online. Hence, it is a good idea to register the domain name for longer time for building your website rather than extending on yearly basis. Just register for the longest possible time of 10 years, and continue focus on publishing valuable content. In this manner, your site will become popular over the period of time on search engine results pages. As shown in the above examples, you can check out the domain age of your favorite and popular news sites to understand how long journey it takes to build a reputable website. Buying and selling of domains is a popular business as old domains with high domain authority tends to get more visibility in search engines. Google, earlier had a PageRank mechanism of giving rank to the domains and pages. On one hand this was motivation for webmasters to improve their rank but on the other hand this was a huge business. People buy and sell domains with high PageRank and also purchase links from such websites. Though Google discontinued PageRank, still we have domain authority tools from other search optimization firms like MOZ. When your domain has high domain authority value then the selling price would be much higher on the market. It is also easy to sell high authority domains in open marketplaces like Flippa. Get cheap domain hosting as low as $3 per month. In this article, you have learnt 3 different ways to find the age of any domains you like or have. Also we have explained the importance of domain age to get more visibility. Whether Google gives importance to domain age or not, it has high impact in driving traffic to a site in many different ways.